It is more than 50 years since the foundation of our corporation. Now that we have entered the 21st century, we consider our corporation is experiencing the "starting period" again. We do our best to provide the products not only for the customers who have had long business relations with us, but also for those who have entered business with us recently. We try to make the proposal even at the early stages of planning and trial production in order to develop the product with necessary function at lower cost, and to start the mass production more speedily. Along with the extension of the domestic production facilities, we founded TAKAHASHI SPRING THAILAND in 1996 to assist the customers in overseas production. 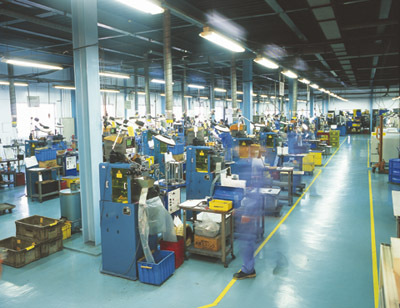 Our production ability doubled in 2003 with the completion of a new plant in Thailand. In this way, we are now fully prepared to provide the products of stable quality steadily in time at optimal cost. We have acquired the International Standard quality certification both in Japan and in Thailand, in order to materialize our passion for product quality. We will continue to make best efforts to meet the customers' expectations by further refinement on our strength: agility and ability to make proper proposals. As a matter of course, we steadily provide with the products of best quality. Besides, we pursue the thorough management of manufacturing process from production planning to delivery of products in order to comply with the requests for multi-sort / small-lot manufacturing or shorter-term of production cycle. The best products in many fields which have the largest share in their respective markets adopt the products of our corporation. We are glad that we can contribute to their success. Our products are used close by your side although they might be hidden and invisible. They are also exported to South-East Asia, China, Europe and the United States, and we are confident that we could be of service to the whole world. Now the field of our activity is extended globally, and we consider that we are about to accomplish a great leap.